but the trouble is developpers don't gave us a way to save these results. This application tries to fill this lack. You can grab other processes controls content: Listview, Listbox, Combobox, Password fields, Static and of course Edit fields. but it won't work with java applications. Notice : you need the both executables (32+64 bit) to be able to grab content of 32 and 64 bit applications. First Drag the cross image on the control you want to select. The control type will be automatically detected. If control contains text, Control Content Saver will try to directly copy content into clipboard. 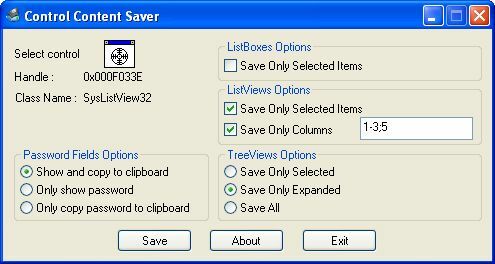 For ListBoxes, ListView or ComboBox, you will be asked to choose a file for saving control content. Save can be done in HTML, XML or TXT format. Do you want to see results now ? Command line syntax allow to save content without a dialog window. No dialog will appear and application will stop as soon as the requested operation has been completed. Application return 0 in case of success, -1 in case of error. File : Output file name. According to its extension, saving will be done in html, xml, or txt (default if unknown extension). OnlySelected Optional : Save only selected item. Available only for ListView, TListView and ListBox, TreeView. OnlyColumns Optional : Allow to specify column number to save for ListView and TListView. OnlyExpanded Optional : Allow to save only expanded items of TreeView. ShowPwd Optional : Show password field without copying it to clipboard or saving it. CopyPwd Optional : Copy password to clipboard. SavePwd Optional : Save password into the specified saving file name. For a static/text/password : Hwnd=0x000D069A File="c:\out.txt"